Microsoft has announced a veritable bonanza of new features for its OneNote note-taking software across multiple platforms, providing added functionality for people who rely on it to organize their thoughts. First and foremost, Microsoft made it easier to save online videos for later use inside OneNote. 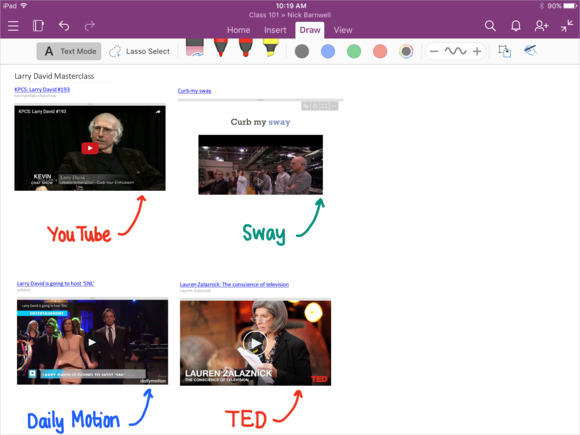 Users can now add a link to one of a handful of popular video services inside OneNote for Windows 10, Mac, and iOS, and Microsoft's software will automatically embed the linked video into the notebook for easy playback later. Users of Microsoft's note-taking software on the iPad can now rearrange audio recordings, images, text, shapes, and any other item on a page by touching and dragging them. To help with that, Microsoft added a lasso tool so that users can select groups of objects and move them around as one unit. Microsoft, in a Thursday announcement, also added support for rotating images in OneNote on iPad and iPhone, along with the ability to insert multiple photos on a page at once rather than having to add them one at a time. OneNote for Windows Phone finally gained support for recording audio, so users can quickly add spoken notes or recordings to their notebooks as needed. Unlike OneNote on desktop or tablets, however, it's not possible to type and record at the same time, which is helpful for avoiding background noise but annoying for people who want to do both at once. In addition to the OneNote news, Microsoft's Office Lens scanner app for iOS and Android also received an update that allows users to rotate pictures they took after shooting, rather than having to retake the photo and reposition themselves. iOS users will also be able to scan and insert multiple photos in a batch, convenient for saving scans from a large stack of documents. What's interesting about the OneNote team's frequent updates is that mobile platforms the company doesn't control are often the first to get updates before Windows Phone. The company is doing more to compete with other players in the note-taking software market, including Evernote, Apple and Google, and having a strong presence across platforms is key to that.